Can I use the trial version of Any DVD Cloner Platinum before purchase? Q: Can I use the trial version of Any DVD Cloner Platinum before purchase? A: Yes, the free trial version will allow you to copy/clone 3 DVDs and rip one chapter of any DVD. You can buy DVD Cloner Platinum to remove all limitations. 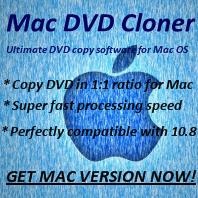 Any DVD Cloner evaluation allows you to copy or clone 3 DVDs. You can find all DVDSmith software on Buy Now / Order page. If you have purchased Any DVD Cloner and wanna upgrade it to Any DVD Cloner Platinum, we also provide a generous discount to you and you can make it with only 9.95 USD! Please let us ( support [at] dvdsmith.com (replace [at] as @ before sending message) ) know if you need the coupon code for purchasing Any DVD Cloner Platinum.